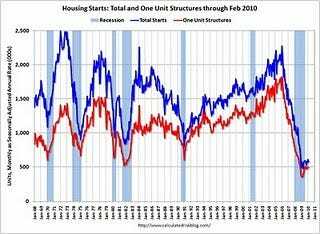 Total housing starts were at 575 thousand (SAAR) in February, down 5.9% from the revised January rate, and up 20% from the all time record low in April 2009 of 479 thousand (the lowest level since the Census Bureau began tracking housing starts in 1959). Starts had rebounded to 590 thousand in June, and have moved mostly sideways for nine months. Single-family starts were at 499 thousand (SAAR) in February, down 0.6% from the revised January rate, and 40% above the record low in January and February 2009 (357 thousand). Just like for total starts, single-family starts have been at about this level for nine months. Here is the Census Bureau report on housing Permits, Starts and Completions. Privately-owned housing starts in February were at a seasonally adjusted annual rate of 575,000. This is 5.9 per cent (±10.0%)* below the revised January estimate of 611,000, but is 0.2 per cent (±9.8%)* above the February 2009 rate of 574,000. Single-family housing starts in February were at a rate of 499,000; this is 0.6 per cent (±10.6%)* below the revised January figure of 502,000. The February rate for units in buildings with five units or more was 58,000. Privately-owned housing completions in February were at a seasonally adjusted annual rate of 700,000. This is 5.4 per cent (±20.2%)* above the revised January estimate of 664,000, but is 15.5 per cent (±13.6%) below the February 2009 rate of 828,000. Single-family housing completions in February were at a rate of 458,000; this is 4.3 per cent (±13.7%)* above the revised January rate of 439,000. The February rate for units in buildings with five units or more was 236,000. This level of starts is both good news and bad news. The good news is the excess housing inventory is being absorbed – a necessary step for housing (and the economy) to recover. The bad news is economic growth will probably be sluggish – and unemployment elevated – until residential investment picks up. Note: on the February snow storms, starts were up in the West and Midwest, and down in the Northeast and South (includes D.C. and Virginia), so the snow probably did impact starts. Of course some builders started spec homes to beat the tax credit expiration – and that boosted starts temporarily.